The first time I heard of Guámpara Music was during the first edition of the AM PM “America for its Music” gathering where professionals from the music industry of the continent met for four days in Havana in June 2015. I had the opportunity there to meet some of its members and see them steal the show during a project pitch, with a fun and original presentation by this group of young people involved in producing and promoting the urban music being made in Santiago de Cuba. But more than that, it was the opportunity to listen and dance until the wee hours to the rhythm of Golpe Seko, one of the groups that make up their catalog. And I thought to myself, “Why isn’t Havana enjoying more of this? If you describe Guámpara Music as a brand-new project, you will find it’s only half the story. The truth is that the men and women in the project have been busy for over ten years working on urban music production and promotion in their hometown of Santiago de Cuba. All you have to do is listen to them for a while. Listen to them and to the music in order to be convinced that this group has more than a couple of things to say on the contemporary music scene. Guámpara’s general headquarters are in a room in Centro Habana, jam-packed with vinyl records and CDs. If he isn’t making music somewhere, as solo artist or part of YISSY & Bandancha, we can find Isnay Rodríguez (DJ Jigüe) on the premises. You don’t have to persuade him to get him to talk passionately about this ambitious and promising enterprise which aims to oxygenate the local urban scene with raw talent, good lyrics and an ensemble of sounds rooted in the Caribbean and eastern Cuba. How did it all start? What are the origins of Guámpara Music, and the context in which it began? Let’s see, even though this project is a little over a year old, it is the result of the work we’ve been involved in since 2000. It has a lot to do with Guámpara Music’s direct participation in the Cuban hip hop movement. In Santiago de Cuba we developed a number of projects whose basic aim was to promote hip hop culture in Cuba, with all of its artistic elements: graffiti art, breaking, DJing, rapping, etc. We also work with rap as a sociocultural phenomenon. In other words, seeing how hip hop can become a tool for social transformation in the neighborhoods and communities that are culturally and economically challenged. We have always felt that the matter of the visibility of the Santiago de Cuba urban movement in the rest of the country (and outside of Cuba) is a problem. The scene in our province has characteristics which make it different, due to how close we are to the Caribbean area. There’s the influence of Jamaica, reggae and other genres such as ragamuffin from Panama and the Dominican Republic, something that is a sort of antecedent of reggaeton. That’s where the idea to create Guámpara Music comes out of. This is a project focused on the promotion of urban music specifically made in Santiago de Cuba. Our intention is to form a quality base which encourages taking that product, like an unpolished diamond, to audiences in Cuba and abroad. Today Guámpara is composed of four groups attempting to cover the spectrum of what is happening in Santiago de Cuba: Kamerun el Akademico takes on R&B, hip hop and reggae variations, Golpe Seko is a duo more focused on rap even though they also are influenced by Caribbean music, Niño Fony creates music that is closer to raggamuffin, and Dj Jigüe, that’s me, works more inside experimental and electronic music, tending to lean towards Afro-futurism but also marked by Caribbean rhythms. Those four groups make up the vanguard of Guámpara Music. As an independent enterprise, what positive proposals and challenges does Guámpara have, from the cultural, economic and legal points of view? At this time, that’s one of our weak points, just to give it a name. From a legal standpoint we have no official status to let us sign contracts with third parties; we aren’t recognized as an institution inside the record-making industry in Cuba. So, how do Cuban institutions look at you…that is, if they even see you? When we created Project G12K in Santiago, we aimed to establish a direct relationship with the institutions. If we were going to hold a workshop, we tried to let the directors of the Casas de Cultura know about it; and if they wanted to participate, they were welcome. We would invite the local press to our concerts. We have always tried to keep up these exchanges for the added perk that they would learn about the essence of the hip hop phenomenon. At the end of the day, that attitude (we even organized hip hop culture workshops to municipal methodologists) helped us. We managed to get in touch with many institutions that had earlier refused to cooperate because they didn’t know about the hip hop phenomenon and acted solely on the basis of the little they knew about it. I think that the same thing is happening now. Many people don’t even know what Cuban urban music is; they don’t know about its development, its history, and all they have are some isolated references or prejudices and they act according to them. Undertaking projects like this one contributes to having everyone who approaches us broaden their knowledge about hip hop and this will help to change people’s ideas about it. How is the project seen today, in terms of sustainability and growth and in its relationship with audiences and the hip hop scene in the capital? After working very hard at the beginning, I think that now that we have seen certain success, we can perceive the impact of all that effort. Thanks to the publicity we have gotten on the web and in the national media, now we can say that Guámpara is known both inside and outside Cuba. We have finished our first musical production, the CD Golpe Seko Brothers by Golpe Seko, and we received the Cubadisco award for Best Hip Hop CD of 2015. At that same event we were nominated for Best Electronic Music CD with Metamorfosis, my first recording (Dj Jigüe). Another success was getting the Lucas award for Best Electronic Music Video with the video-clip Electrotumbao. 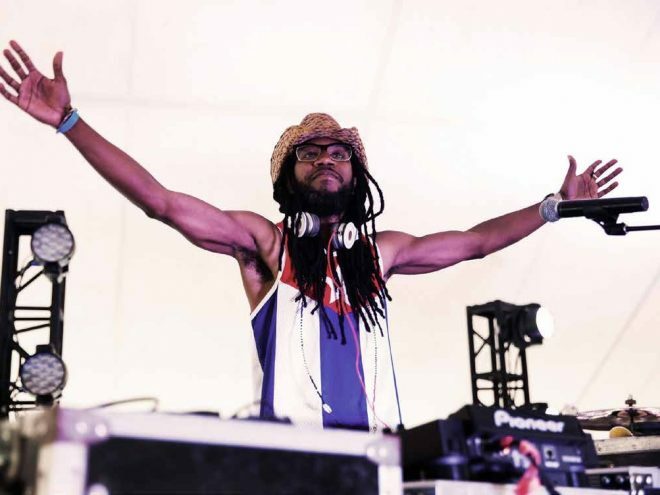 Golpe Seko’s participation at a number of national festivals like AM-PM and Musicabana has also been important, as has my participation as DJ-producer at festivals such as Mananain Santiago de Cuba, and Afrolatino, in New York. The new map being drawn in Cuba because of the process of re-establishing diplomatic relations between Cuba and the United States is generating many expectations about the future of the cultural industry in Cuba. What dangers and possibilities do projects like yours have within this context where tomorrow there could be an avalanche of big US companies setting up business here? We can’t assess that kind of context because we don’t know how it works, what its pros and cons are, what could result from this. But I do think that this opening that is drawing near (or at least we think so) of Cuba to the international market, particularly in the music industry, is going to be positive for all artists because it’s going to give them the possibility of coming in direct contact with a market they have been trying to gain access to for years. Even though Cuba, on the one hand, has not felt that sort of artistic commercial aggression, on the other hand Cuban institutions have lacked the commercial vision regarding the contemporary phenomena that are growing in our country. That lack of vision hasn’t allowed esthetics like ours to thrive the same way they have thrived elsewhere in the world. And I’m not just referring to rap. The fact there is an opening will give artists the opportunity for alternatives to be able to channel what they do. Of course we will still have the job of making good music that is attractive and which has an impact outside of Cuba. The music industry can be unfair. Do you think that the Guámapara Music project can be successful? Cuba has a lot of talent, many excellent artists who can make the country a first-class element in the urban music market. Our country is already an important player but it hasn’t started to compete commercially due to that lack of vision of institutions that haven’t done their job. I always present the example of Orishas’ success, a slap in our own faces. And this wasn’t the only interesting project that was around then. Orishas showed that when you conceive a quality product you can enter the market and become established. When I’ve gone to countries like Brazil, Venezuela and Mexico, countries that are part of the market and which have their own commercial dynamics in urban music, I’ve been able to see for myself that they think of Cuba as a top-quality player. Unlike the rest of Latin America, Cuban artists don’t have a lot of opportunities to participate in well-organized festivals, to tour different countries and earn money for their shows, sell records, etc., etc. Yet in spite of this, we are being looked up to. It has been shown that a Latin American urban music artist can make a living with his or her work because there is a market for it; what makes us different is the absence of a process to introduce that product on a commercial level. That depends on people. And that is Guámpara’s dream.